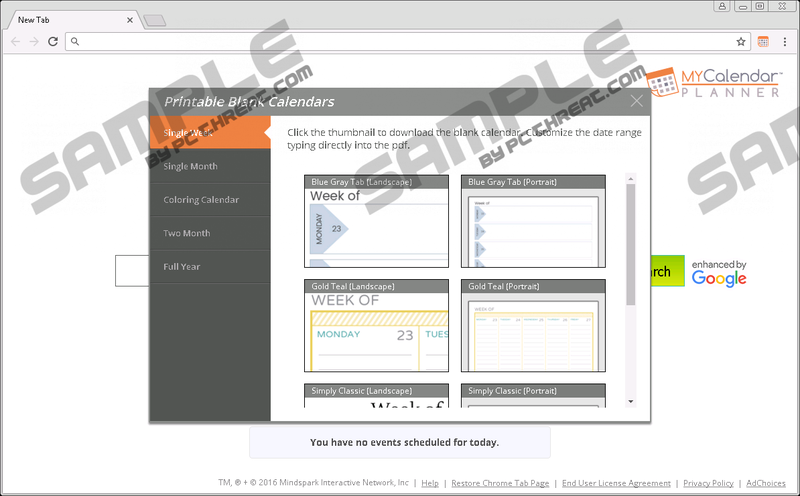 MyCalendarPlanner Toolbar is an add-on that was created by Mindspark Interactive Network, Inc. Have you heard this name before? This company stands behind StreamlinedDIY Toolbar, EasyWeatherAlert Toolbar, CatHomepage Toolbar, and many other toolbars that we have reported before. These extensions are officially represented via separate download pages, and they are also available for downloading at the Chrome web store. The extension we are discussing right now can be installed from mycalendarplanner.com/index.jhtml, as well as chrome.google.com/webstore/detail/mycalendarplanner/kcdajnholfpkidcgghgocnbmbmlklmpn. As our research has revealed, this extension is compatible with Google Chrome, Mozilla Firefox, and Internet Explorer browsers, which means that many users have access to it. Well, is it a good idea to install this extension or will you need to delete it? Continue reading to learn all about this Mindspark toolbar. We have also added the MyCalendarPlanner Toolbar removal guide. The appeal to install MyCalendarPlanner Toolbar is that it promises to help you plan your time in a convenient manner. The official download site suggests that this tool can help you keep track of all important events, and the program lives up to the expectation by providing us with Month View, Week View, Day View, and Add Event tools. These tools are represented on a page that, at first sight, looks like a home page of a search engine. At the bottom section of the page, we see the aforementioned calendar tools, as well as a reminder of the events happening today. However, there is no denying that the main focus goes to the search dialog box that has the “enhanced by Google” tag attached next to it. All Mindspark tools open backdoors to third-party search engines, and that is why they do not have the best of reputation. After all, the seemingly useful MyCalendarPlanner Toolbar is not promoted as a search tool. Due to this, many users jump to the conclusion that this toolbar is a browser hijacker that requires immediate removal. You should make up your own mind, but our recommendation is to delete MyCalendarPlanner Toolbar from your web browsers. In our guide below we show how you can erase the toolbar from your browsers manually. Firefox and Chrome users will need to eliminate extensions and Internet Explorer users will need to uninstall “MyCalendarPlannerTooltab Internet Explorer Homepage and New Tab” application. It is unlikely that your homepages and new tab pages will remain corrupted after that, but you should check. If the guide below fails you, do not hesitate to leave a comment down below, so that we could adjust the guide. Another thing you should do is inspect your operating system. Although it does not look like the toolbar is spreading via software bundles, we cannot deny the possibility of this happening. Scan you PC to look for malware, and, if it exists, utilize a trusted malware remover to have your operating system cleaned automatically. Open the browser and tap keys Alt+F together. In the menu on the right select More tools and then click Extensions. Identify the undesirable extension, click the recycling bin, and choose Remove. Open the browser and tap keys Ctrl+Shift+A together. As the Add-ons Manager appears in the new tab, move to Extensions. Identify the unwanted extension and click the Remove button next to it (if a pop-up appears asking if you want to restore homepage, confirm it). Click the Start logo on the Taskbar and open Control Panel. Double-click Add or Remove Programs to access the uninstaller menu. Select the undesirable app and click Remove. Launch Internet Explorer to see if the homepage was restored. If it was not, tap Alt+T, and choose Internet options to modify the undesirable homepage tool. Click the Windows logo on the Taskbar and open Control Panel. Move to Uninstall a program to access the uninstaller menu. Right-click the undesirable program you wish to get rid of and choose Uninstall. Launch RUN by tapping Win+R keys and enter Control Panel. In the menu click Uninstall a program to access the uninstaller menu. Identify the unwanted program, right-click it, and select Uninstall. Quick & tested solution for MyCalendarPlanner Toolbar removal. Hi i am David. I am a amauter writer. I am trying to write a fantasy novel. fantasy novel. Pls, read and give me some review.